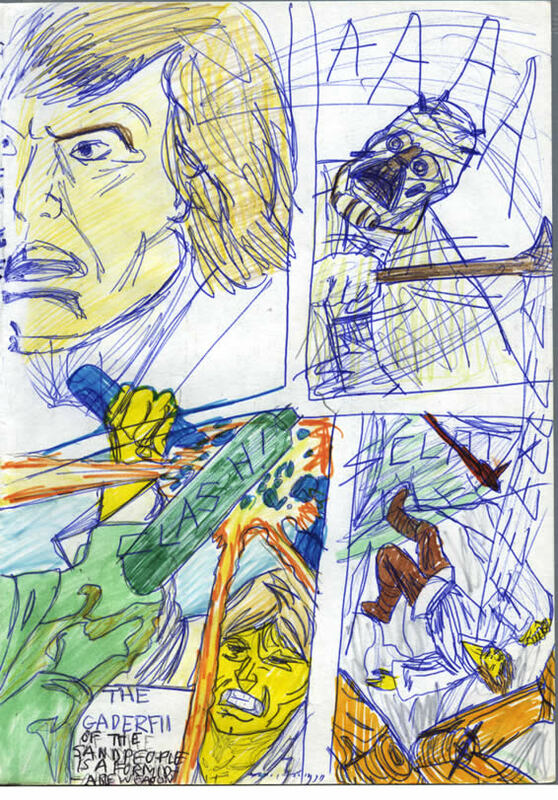 “AAAA EEEEEEEEEE” It flows from Luke – top-left – across the assailant and down the page as it all goes comical-looking when Luke and Threepio fall off a cliff. Or something. The other part of this story though, is that Niall said that he had a cine-camera and projector at home. This made me very envious indeed! 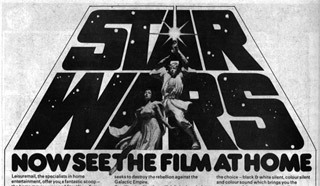 Especially considering that Star Wars Weekly comic was advertising an 8mm, 8 minute B&W edit of the film that you could *gasp* show in your own home! I can’t tell you the tingles of excitement this caused every time I imagined this possibility. 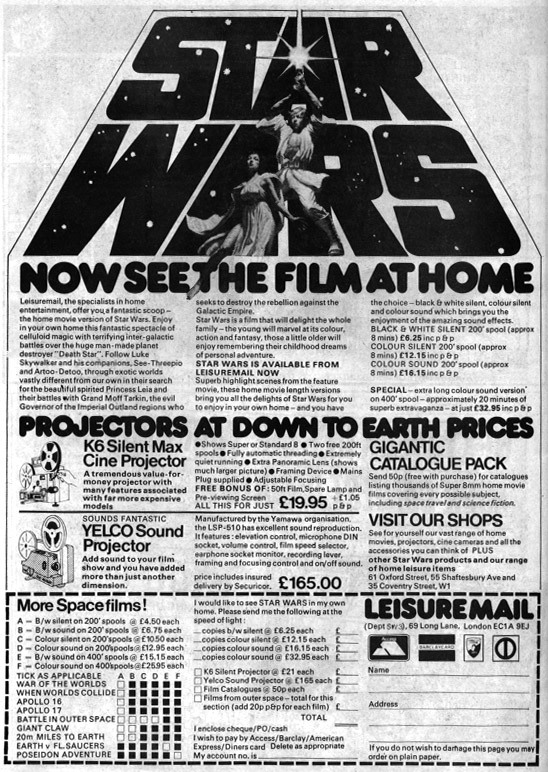 “So that’s STAR WARS – the actual STAR WARS showing in my house, day or night, any time I want it.” I pestered my mum and dad over this. This was before home video – never mind DVDs and Youtube. Can you imagine it? BLIMEY! Pleasure overload – to quote Bart Simpson. But no, I wasn’t one of those kids who got everything I asked for. Thank goodness. I was just now flipping through the comics trying to find the ad and I noticed some pale patches on the artwork. I’m reminded that we used to press Blu-Tack onto them to get a reverse impression of the artwork. I really made a mess of those (collectible) comics. Bits cut out, bits coloured-in, posters removed and put on the wall… sigh. Chaykin’s original version of my copied image was terrific. The rifle shattering – Luke’s clenched teeth. More violent than the film itself. 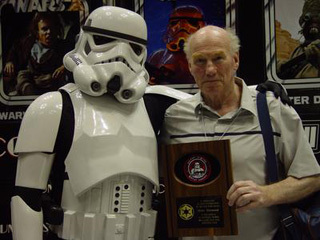 Stunt expert, the late Peter Diamond receiving his honorary 501st Legion member award. Ironically, shooting the scene was extremely dangerous. The late Peter Diamond – who wore the Tusken Raider costume – recalls that he couldn’t see anything during the scene as he lashed out at Mark Hamill. So when you see Hamill rolling rolling about trying to dodge those Colonel Gaddafi Stick blows: it’s for real. Luke is startled and cries out, "Aaaaaaaa..."
A Tusken Raider swings his Gaffi Stick! 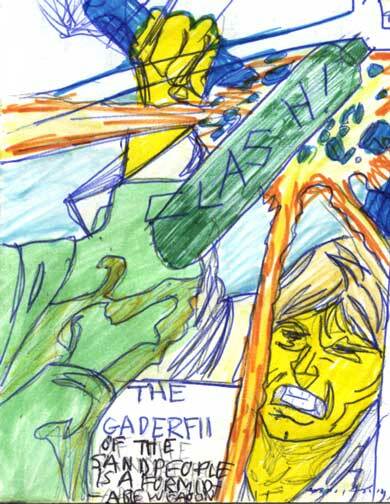 Luke raises his rifle to protect himself, but the Sand Person's Gaffi Stick smashes it to pieces. 'SCLAT!' goes the stick, and Luke and See Threepio fall backwards off the edge of the cliff. "EEEeee..."